Our newest production switcher, leveraging the creative power of the HANABI series. HVS-490 switcher inherits key technology of HVS-2000 and HVS-390HS while opening the door to even more affordable 4K production. Exclusive MELite™ technology extends the switcher’s 2 M/Es to offer 6 M/E performance. *1 Expand your switching capabilities even more by assigning FLEXaKEY™ or feature rich 2.5D DVE, for compositing with up to 12 keyers. Take advantage of this truly broad range of switching in live production. MELite expands the capabilities of AUX transitions. With an AUX bus, able to preview transitions before executing them, and enjoy the same control over AUX output as for PGM or PST. Two MELites are provided, and an optional HVS-49IO card brings the total to four. Assigning FLEXaKEY to an MELite expands the system adding the equivalent of two M/E buses to the standard two Full ME’s, brings the total available to four. 4–6 M/E performance is possible in a 2 M/E switcher. 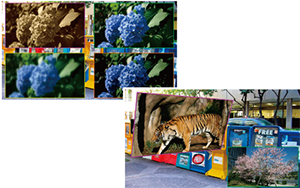 Preview output from an AUX bus when applying transitions (cut, mix, or wipe) or keying. This background breaking technology makes sure your production is ready for virtually any request. For greater impact and more sophisticated switching, MELite can be assigned before M/E buses. Any ME can be assigned to multiple on stage monitors for independent background transitions and graphics transitions all from the same control panel. Special FLEXaKEY keyers are designed for flexible reassignment. The four FLEXaKEYs provided operate separately from standard keyers of the full M/E buses. Easy keying of four different FLEXaKEYs in any AUX bus is another highlight enabling impressive performances beyond the reach of conventional switchers. Quad FLEXaKEY system can be freely assigned to M/E or AUX buses. Combine up to eight keyers for an M/E bus (4 keyers + 4 FLEXaKEYs). P-in-P display is possible using an AUX bus, and assigning FLEXaKEY to an MELite enables use as an upstream key. 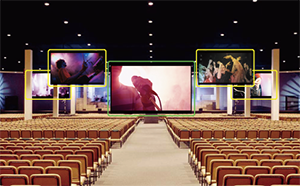 FLEXaKEY can also be applied to create a multi-monitor video wall with a single HVS-490. Choose from cut, mix, or wipe transitions. In addition to 100 wipe patterns, the switcher offers 16 useful 2.5D DVE wipes such as rotate, perspective and reposition. Also rich effects including mosaic, posterization, pseudo color and defocus are also provided. 16 video inputs are provided, expandable to 40, along with 9 video outputs (including 1 HDMI port) that are expandable to 22 (including 2 HDMI ports). For 4K*2, 8 to 10 inputs and 6 to 7 (including 2 HDMI ports) outputs (expandable to 7) are provided. See “Options” for details on expansion cards. *2 HVS-49IO and HVS-49EXP4K are required for supporting 4K. HVS-490 provides three displays of multi viewer output, each supporting up to 16-split display. More than 10 screen layouts each are available. This provides an optimal monitoring environment for both the main operator and other users. 4K output is supported via HDMI 2.0 Level B. Via HDMI outputs, monitor four images on one screen. Using 3 multi viewer outputs and PGM output, up to 49 windows are displayed. Supports 4 AES (8 channels) of balanced or unbalanced audio input and output. Able to demultiplex AES audio from video/clip input and multiplex AES audio into video output. Use an internal sampling rate converter to sync audio input to the system. Ready for 1080/59.94p/50p/29.97p/25p formats, the switcher processes 4K video from the quad 3G-SDI output of 4K cameras in 2SI (2-sample interleave) or SQD (square division) format. The HVS-490 was designed with future 4K upgrading in mind. By adding optional expansion cards provides up to 10 4K inputs and 7 outputs. What’s more, unique use of AUX buses enables a 4K switcher to have the equivalent of 1–1.5 M/E features. 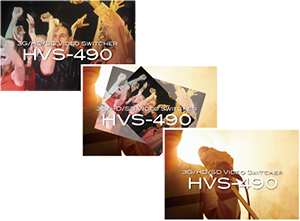 The HVS-490 has an incredibly powerful feature set making it ideal for live staging and event applications where systems must be set up quickly and temporarily. Event memory and macro functions make it easier to prepare for performances. MELite eliminates the need to have several switchers ready for multi-monitor staging, greatly reducing the equipment required. It’s essential to keep production simple and easy, preventing mistakes and helping operators focus on staging. The HVS-490 with its robust feature set is perfect for small mobile video production or Up-Link in which space is limited. The HVS-490 switcher offers a rich feature set perfect for live or recorded production. With integrated frame synchronizers and multi viewer, the HVS-490 can reduce the amount of equipment required in the truck. Using multiple control FOR-A control panels, the system can also provide an environment for several operators each in charge of separate tasks for example one for the main event and a second for a web cut of the same event.